When I initially read the e-mail announcing various internship opportunities available over the summer break, my mind immediately got into action. I was extremely determined to secure a position as a summer intern and thus started going over the research interests of our faculty members. While doing so, a clear, easy decision was made. And thus, I decided to become a ‘minion’ (Price, 2013). Dr. Jess’s research on memory and Alzheimer’s disease had always intrigued me, and therefore this internship provided me with an ideal opportunity to further gain experience within this area. During the course of my internship, I was involved in conducting three different experiments. One of them investigated the effects of modality on recognition memory, comparing visual, auditory and cross-modal conditions. Perhaps one of the most difficult challenges that I faced while carrying out this study was… any guesses? Well, programming it. I remember Azlina (Dr. Jess’s PhD student) and I spent quite a while on creating an accurate list of stimuli and coding it appropriately. After what seemed like a never ending task, we were faced with a greater challenge. Perplexed as to why, E-Prime was crashing, Azlina and I started to decipher what was going wrong it. Alas, after correcting errors, the program ran successfully without crashing. The typical joy of finishing programming, that all of us can relate to, followed. Meanwhile, I realised the meticulous and perseverant nature required to carry out any research. These traits were further honed when I recruited participants and then subsequently analysed data. However, the highlight of my internship was getting to use the Electroencephalography (EEG) system. Almost all of us have at some point during our degree come across EEG studies and gained insight into how it is used in research and clinical settings. Some of us might have even wanted to get our hands on it and learn how to use it. I was one such individual and being given the chance to do so, I was ecstatic. We (Dr. Jess, Azlina and I) used this technique to validate a novel state of the art cognitive task named ADEPT (Alzheimer’s Disease Evoked Potential Test). This experiment formed the basis of a series of experiments to develop a reliable and valid diagnostic tool for Alzheimer’s disease. Nervousness and apprehension lingered over me initially as I constantly reminded myself about how expensive and delicate the EEG system is. With practice and proper training, I was able to put aside my concerns. 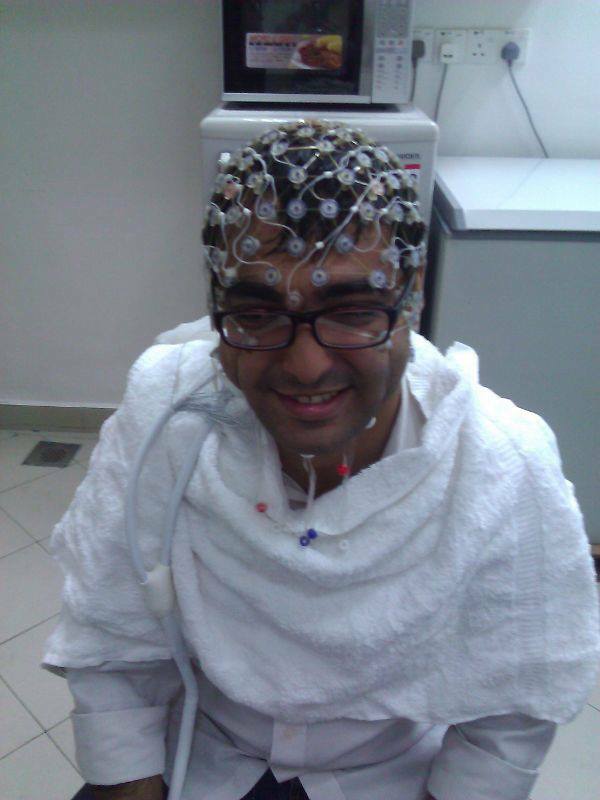 Conducting research using an EEG machine is a totally different experience than what we are usually used to. From preparing the electrolyte solution in the required way, to ensuring the electrode cap is properly placed on the participants’ heads without causing them any discomfort, one has to be extremely precise and diligent while conducting experiments using this technique. Analysing data and converting absurd looking raw EEG waveforms into Event-Related Potentials (ERPs) is an extremely time consuming process. To summarize, one needs to perform a multitude of steps to derive ERPs such as referencing, filtering, grand-averaging, etc. I am sure I have missed out on a few steps here myself. This is just the first part of the data analysis process. What follows is a series of electrode and ERP component selection procedures before conducting statistical tests to make ‘real sense’ of the data. Nonetheless, this technique can be very useful for research purposes and I guess it is worth the hard work required. Apart from gaining research experience and experimenting with fancy gadgets, I also learnt how to effectively communicate with my supervisor as well as my colleagues. Dr. Jess’s lab lunches served this purpose in addition to being full of fun and spicy delicious food. I believe the summer internship not only helped me further realise my passion for research, but also instilled within me the transferrable skills that employers and universities these days look for, such as communication and perseverance skills aforementioned. Most importantly, I learnt how to be an independent researcher, juggle my way through different tasks, and meet deadlines set. I would highly recommend the summer internship program to other undergraduates, particularly because it is a platform to realise your interests – both within Psychology and broadly speaking, career wise. I realised where my interest lies so much so that till today, I help my team within my capacities and take an active interest in how our research is developing.